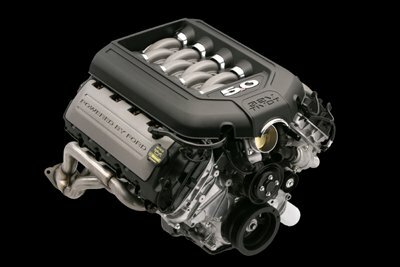 A new Coyote Engine Dyno Test of the 5.0 found in the 2011 Ford Mustang showed just how underrated the new powerplant really is. The folks at Powerblock recently had the opportunity to take a brand new, stock 5.0 coyote crate engine (Is your credit card shaking? )and find out just how much power it makes. And I have to say, the results put a smile on my face. After a first run on the dyno, the new 5.0 liter Mustang Coyote engine hit the ground running, with 460 horsepower at 411 pounds of torque. Compare that to the advertised 2011 Mustang specs for the engine of an already impressive 412 horsepower and 390 pounds of torque. Not wanting to blow up a brand new motor, they contacted Ford Racing, to find out what the maximum rpm limit was, that they could safely use for the test. The news was interesting. Apparently, you can run this Coyote engine all day at 7,300 rpm. And I don't doubt, that part of that reason is the dual overhead cam setup,combined with a racing style oiling system, that includes separate jets to squirt oil inside each individual cylinder. Have I kept you waiting too long? Sorry. Here's the results of the big pull on the dyno. How about 465 horsepower, at 413.7 lbs of torque. I'm having a hard time not wondering just what this would be like in my next Mustang restoration / build, a 1970 Boss 302 tribute.